Facebook page administrators use different types of methods to get more fans and followers for their business pages. This comprises of regular content update and initiating targeted conversations with the followers base. Some companies also use different promotional giveaways to keep their page fans glued to their stream of inviting page updates. Interestingly, there's an excellent tool provided by Facebook that is often overlooked by page administrators. If leveraged correctly, it can increase fans and followers to a greater extent. This tool is called 'Insights' that provides important analytics data related to your Facebook page. After analyzing this data correctly, you can initiate targeted steps to make your page, a happening place. All it takes is some patience to correctly analyze the available data to formulate optimized page engagement strategies. The available data to segregated into different groups based on the actions taken by your page followers. Page owners can easily analyze this data for their benefit. Let's see how we can utilize Facebook page insights to optimize our page promotion strategies. Unique visitors - It is one of the most important metrics for any web page. In simple words, you get to know the number of fans landing on your Facebook page on any given day. Whether it's mid-week or a weekend holiday, you can know the number of visitors reaching your page through this metric. You can further break down this report on a per-day, per-week or per-month basis to get a broader picture. This way you can get a fair idea about most promising days in a week or in a month. If you take a longer period, you can see which months gave you the most traffic. This may help you in understanding the seasonal traffic rush. Once you've found the days you get the most traffic, you can concentrate your marketing efforts on those days for maximum results. Activity breakdown - Just knowing about the count of visitors doesn't give you much information about how fans behave when they interact with your page content. There's a big difference between a visit and a highly engaged visit. If the majority of your visitors falls into the latter category, then you're going in the right direction. 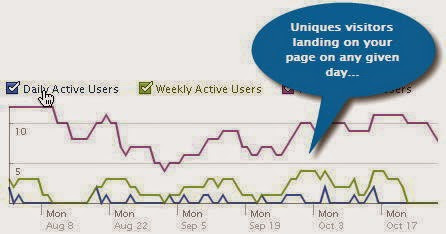 Daily Active Users Breakdown report clearly shows what visitors are doing when they reach your page. This includes watching a video, commenting on a story or liking a status update. This extremely valuable data gives you insights into the type of content your page fans like the most. This way you can create a similar type of content to get more engagement from fans. You can even find out which activity is more prevalent among the fans by exporting this data in excel sheet and calculating the percentage of each activity. Demographics - Now this is icing on the cake. 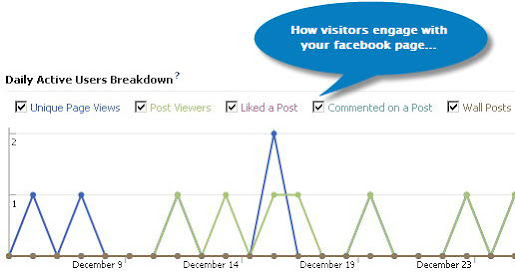 Facebook insights deliver demographic data of page visitors to complete your web analytics exercise. You can segregate your fans on the basis of gender, age, language, country, and city. This is a huge advantage for Facebook pages having a large fan following. 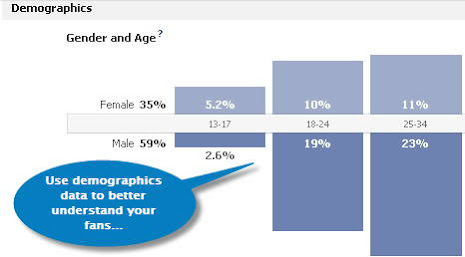 Administrators can easily visualize the age group and gender that interact most with the page. To get better results, I'll strongly suggest you take a long duration (at least 6 months) data set. This way, you'll get a clearer picture of the gender and age distribution across the timeline. Beforehand knowledge of location, gender, language, and age are vital when preparing engagement strategies for your page. You precisely know what to post and how to encourage more interaction. With some clever data crunching Facebook administrators can deliver better results for their company's Facebook page. So what are you waiting for? Dive into the wonderful world of Facebook page insights and pump new life in your Facebook page.